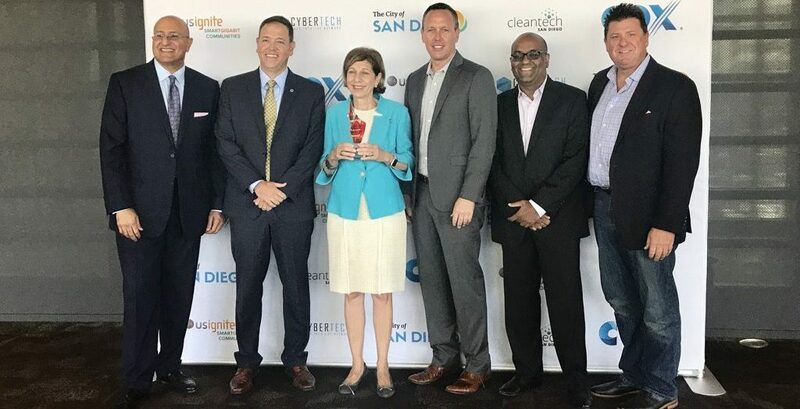 On September 6, US Ignite announced the selection of Cleantech San Diego and CyberTECH as the key innovation partners for the City of San Diego as a Smart Gigabit Community. US Ignite’s Smart Gigabit Communities (SGC) program enhances local community innovation ecosystems by enabling communities to accelerate the development and deployment of next-generation, gigabit applications and services that run on advanced networks. The City of San Diego will be a strategic partner for this initiative, and the City aims to create the largest city-based deployment of an Internet-of-things platform in the world. Currently, the City is upgrading traffic lights to LED and integrating the traffic light system into a connected digital network. Recently, the City of San Diego also announced that San Diego will become a “2030 District,” a high-performance building community that aims to dramatically reduce the environmental impacts of building operations and construction. The goal is to have a 50% reduction in energy, water, and transportation emissions in participating buildings by 2030. Cleantech San Diego and CyberTECH will empower the San Diego community and provide the needed support and infrastructure to develop six smart gigabit applications that address local needs such as infrastructure, workforce development, public safety, education and community health. These applications will dramatically impact and shape the way that residents of San Diego live and work. In addition, the City of San Diego will be able to share in the dozens of smart gigabit applications developed in the 20 other cities participating in the Smart Gigabit Community program nationwide. Cox Communications helped bring the Smart Gigabit Communities program to San Diego through a $300,000 grant to US Ignite over three years. Cox Communications has invested more than $1 billion in the region to help connect San Diego residents and businesses to the latest telecommunications advancements available. Cox Communications remains committed to deploying gigabit speeds to additional neighborhoods. Cox Communications also continues to bring low cost internet access to students on the national free a reduced school lunch program or who live in HUD communities through the company’s Connect2Compete initiative, as well as Cox Technology Centers at Boys & Girls Clubs that provide free access to computers and the Internet. US Ignite has organized local communities and assisted in building more than 100 next-generation application profiles over the past three years. Each participating community receives access to a low-latency and ultra-fast network with local cloud computing and storage capabilities that will support highly interactive and visually immersive experiences not possible on today’s commercial Internet.